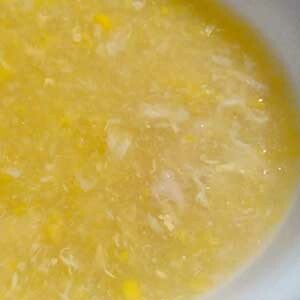 Melt the butter in a pan over medium heat and brown the chicken thighs on both sides, 5 to 8 minutes per side. Remove the chicken thighs and set aside. In the hot pan, cook and stir the onions until softened, about 5 minutes. Pour the apricot halves, chilli sauce, brown sugar, cinnamon, ginger, and black pepper into a blender or use a hand held bar mix, and pulse several times to puree. Pour the mixture into the skillet with the onions, bring to a boil, and reduce heat to a simmer. Simmer the sauce until slightly thickened, about 5 minutes. Return the chicken thighs to the sauce, and spoon sauce over the chicken. Simmer until the chicken is tender and no longer pink inside, 15 to 20 minutes. 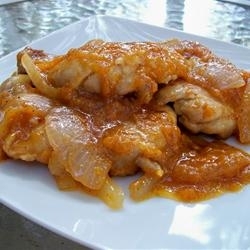 Serve chicken on a bed of steamed rice and topped with sauce. Adobo is the immersion of raw food in a stock composed variously of salt, garlic, chilli and vinegar to preserve and enhance its flavour. This twist on the classic adobo dish uses duck maryland, which makes this version particularly rich and satisfying. Enjoy and live to eat! Season duck maryland with salt and black pepper. Heat vegetable oil in a large, deep pan over medium-high heat; add duck legs, skin side down, and cook until browned, 3 to 4 minutes per side. Remove duck legs and drain all but 1 tablespoon of duck fat from the pan. Cook onion in reserved duck fat over medium heat until onion begins to turn translucent, 3 to 4 minutes. Add garlic; cook and stir until fragrant, 1 to 2 minutes. Stir chicken broth, rice vinegar, soy sauce, sambal chilli paste, and bay leaves into onion mixture; bring to a simmer. Return duck maryland to the pan, loosely cover, and simmer until duck maryland are tender and easily pierced with a fork, about 2 hours. Remove cover from the pan, increase heat to high, and cook until sauce is thick, about 5 minutes; season with salt and black pepper to taste. 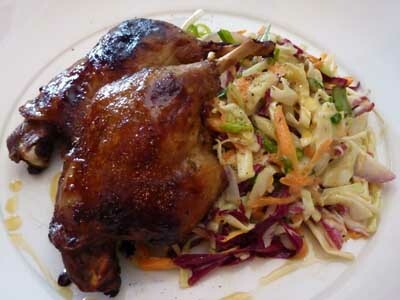 There is a huge misconception about duck and cooking it. It really is very easy and nothing to be afraid of. This recipe for pan-roasted filet of duck breast is fast and easy, and delicious when served with a cherry sauce. It’s Chris’ speciality! Makes 6 servings of Pan-Roasted Duck Breast. To make the duck: Heat oven to 200 degrees celsius. Season both side of the duck breast fillets with salt and pepper. In a large ovenproof pan over medium heat, add olive oil. Pan fry duck breasts, skin side down first for 4 minutes. Flip duck over pan fry for another 4 minutes. Place the pan in the oven and roast for 8 to 10 minutes for medium rare. For the sauce: While the duck is cooking, combine cherries, brown sugar, butter and duck stock in a saucepan and bring to a boil. Reduce heat and gently simmer 5 minutes. Carefully taste and adjust seasonings, if necessary. 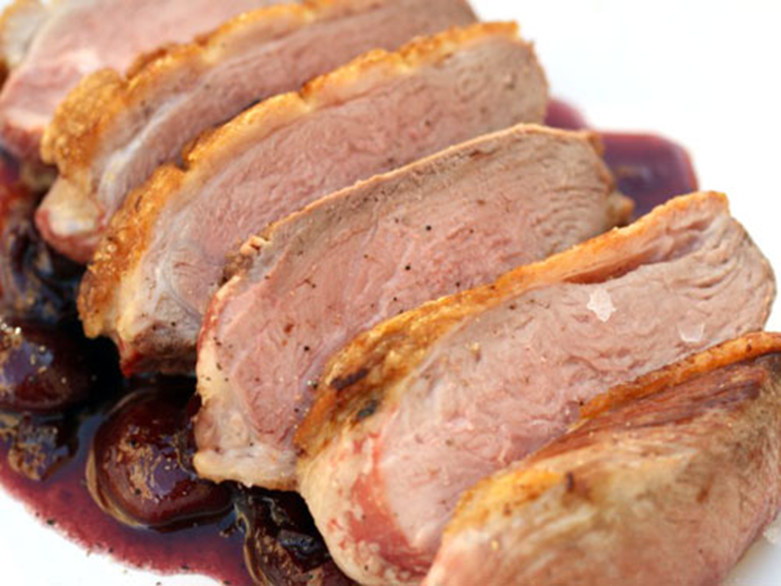 Drizzle over plated pan-roasted duck breast and enjoy! In this dish we present kangaroo fillet marinated in spices, pan-fried with an attractive selection of new season vegetables. Heat oil in a wok or heavy frying pan to very hot. Brown fillets on all sides at a very high heat for two minutes then set to one side, cover with foil and rest. Slice zucchini and blanch in boiling water for 1 minute along with the snow peas and baby corn. Sauté spring onion quickly in the wok used for the roo and quickly stir fry the blanched vegetables and the sliced capsicums for 1 minute, keeping them nice and crisp. Serve the kangaroo meat and vegetables on a large serving plate and add a sprig of rosemary. Enjoy!